If you signed up with my referral link when I posted last time I didn’t get any referrals but you could go manually enter it under the help tab where it says set my referrer. You only have from tomorrow February 17th till February 24th to do this. If you haven’t checked out DrugWars yet it’s a cool game on the Steem Blockchain like the old popular DrugWars games from back in the day. The best part is you earn Steem based on your drug production. You could also earn more Steem by vesting the Drugs you produce in the “Bank Heist” for a piece of the take in Steem based on your percentage of vested drugs for the daily heist. Theres more than just producing drugs you need weapons and alcohol also to upgrade your buildings or to produce units. You need to use good strategies to utilize your resources best. The game reminds me of a game like TronGoo or something like that. But they made it in a way cooler way in my opinion by incorporating the old DrugWars game almost everyone is already familiar with. Start playing now while it’s still early. Whoever starts early on games like this usually does the best. I also like to see that they are still working on improving the game and are not just satisfied with what they got. 👍 Good Work @drugwars team. Check out their post breaking down the improvements. 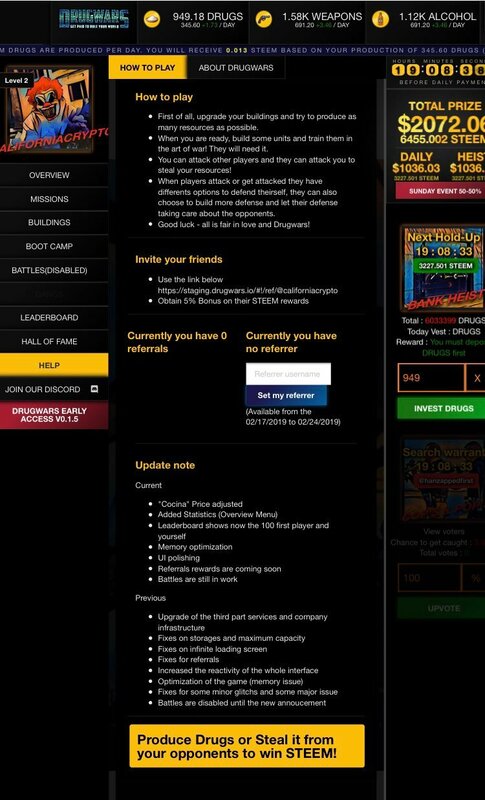 If your not playing I’d appreciate if you used my referral link to sign up and if you are playing and haven’t entered anyone as a referrer Id appreciate it if you considered entering me. Thanks for following me and be sure to hit that upvote button. Here’s my link below to sign up now.